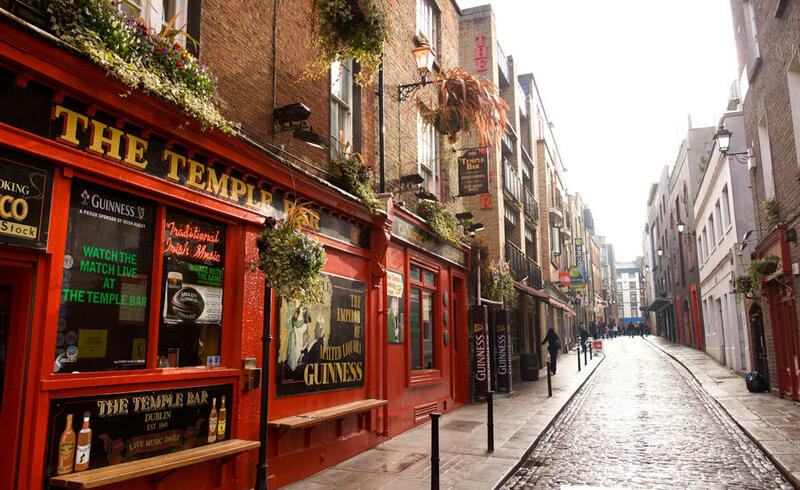 Temple Bar: This is both an actual bar/pub, but also a neighborhood kinda like “Times Square.” Lots of shopping, lots of nightlife. Guinness Distillery Tour: Have you ever been to the World of Coke? This tour was like that – very planned and done up, with some cool parts and some just ok parts. You don’t actually see Guinness being made, but do get a free pint at the end. If I had to make a decision between one or the other, though, I’d choose the next option and just get a picture by the cool Guinness gate. Trinity College/Book of Kells: We did this because we would’ve kicked ourselves if we hadn’t. Having seen the Magna Carta in England, I wasn’t terribly impressed with the set up, but it was neat! Penney’s – this department store is like H&M on crack; HUGE and with a beauty and home section; I bought some work clothes for 6 euros an item (a maroon blazer, a blue and red cardigan) and probably could’ve spent even more money if I didn’t have suitcase space to worry about; This store was in the same general area as Avoca. Newgrange: This looked like a cool mound site, but we ended up not wanting to actually pay to wait and ride the bus up! The tours are guided and do leave at certain times, so if you decide to do this you might want to check the times ahead of time. Belfast: I ADORED Belfast, and plan to go back there on another trip. We only had a few hours there, but I want to go back RIGHT NOW. If I had to compare the cities, Dublin is Chicago and Belfast is NYC (feel wise, not size wise). I don’t know if that helps or hurts it in your eyes, but that’s just how I felt about it. We just walked around and didn’t do any tourist stuff but it was fun! There’s LOTS of street art. *HOTEL: Ballygally Castle/Beach: The actual castle area is pretty small, and many of the hotel rooms are in a new addition. It was nice and the coastline out front was so gorgeous to wake up to! The restaurant in the castle was AMAZING…look in the food section…; We didn’t walk down on the beach; if I’d had better shoes that could get a little dirty I probably would have! Carrick-a-Rede: Rope bridge area maintained by the National Trust – paid about 10 pounds I think. It had a gorgeous walk down to the bridge and then quite a hike (but beautiful) back up to the parking area. Giant’s Causeway: GO GO GO – You can actually park at the train station down the hill and walk up, bypass the gift shop and get in FOR FREE! Additionally, you can park next to the entrance and pay a fee, or even pay a fee to take a tram down right to the causeway. We enjoyed the walk, though, and like all the other coastal areas, it was gorgeous. We spent about an hour and a half here, and I wish I’d had three hours. It was really gorgeous. Tip: wear tennis shoes! Avoca – This is a shop like Anthropologie or maybe even kinda like a really upscale Urban Outfitters, but on the top floor there’s a café. We had scones and coffee and it was really fun! The one we went to was near Temple Bar and there was a larger shopping area around it where we spent some time. Market Bar – In a hotel. Cool atmosphere, just okay food. P. Mac’s pub – fun but young atmosphere. They have library style corrals with board games. I felt kinda old, but it was fun! Bunsen (burgers) in Temple Bar – like Shake Shack, BurgerFi, or Smashburger. It was good! Made in Belfast: MUST GO – I think there are multiple locations of this place, but we went to one near a nice parking deck J. I can ask the drivers to remember the location if you need it. Order a cocktail, trust me. The Dirty Onion (Belfast): Supposedly this is the oldest pub in Belfast. It was fun J. Also in a cool, street art-laden area. Ballygally Castle: We had dinner and breakfast – while I didn’t eat enough at the breakfast to justify the price (we’d had it included in our hotel room price), the dinner was AMAZING. I had a curry that was spicy and delicious! Fullerton Arms: This was a pub connected to an Inn (I think?) in a little town between Carrick-a-Rede and Giant’s Causeway. The food was INCREDIBLE! It has a Game of Thrones Door (which you’ll see advertised all over the place, to not look like much to me) so it’s pretty popular to be in such a small little town. Seriously, the food was amazing. Portrush: We stopped for wine, stayed for gin and tonics. Cute town worth stopping in, but we seriously only drank and then left… I can’t even tell you where we stopped. You can book buses to/from the airport online. If you’re getting there or leaving really early, I recommend booking online because we couldn’t find an attendant at the station and had to make all the arrangements on our phones, which was frustrating. The bus itself was really nice, though! Get a power strip to plug into your converter. Another girl and I used the sets linked and it was great having the USB ports, too. My curling iron shorted out, but everything else (including my Fitbit, phone, and my friend’s iPad) were all just fine. There are MULTIPLE security checkpoints for both departure and re-entry (I was only expecting one), so don’t lace up your shoes too early if they’re difficult to get off J. THE WEIRDEST thing to me was that in Dublin, people don’t walk to one side of the sidewalk. You know how in NYC, locals get really pissed off if people spread out too much (walk side by side?) on the sidewalk? Don’t be surprised in Dublin if there’s just this wave of people spread out all over the place. I didn’t like it. But then figured out I didn’t need to worry about weaving around people because they didn’t think I was rude for doing it. ONE SCARF - No matter how many "nice outfits" I thought I'd need, no matter how many awesome scarfs I carefully paired with shirts while packing, I pulled one black and brown one out of my bag on the first day and wore it everywhere. I won't tell you how much I packed, but for eight days I wish I'd had two pair of jeans, one pair of leggings, two undershirts and five long sleeve shirts/sweaters. Two pair of shoes, one of them sneakers. AND ONE SCARF.